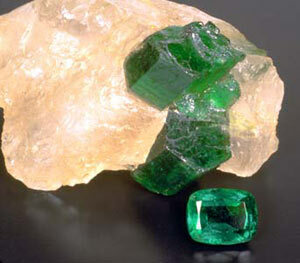 Gemfields achieved a record average price for “higher-quality” rough emerald at an auction in Lusaka, Zambia. The miner sold 470,000 carats for an average of $70.68 per carat at the sale in Lusaka, which ran from March 30 to April 3. Total revenue generated was $33.1 million. But without a proper government in Zambia at the moment, all this money will go to develop other countries. In serious countries such as Botswana, all this money would remain in the country to develop the country. But the PF government will only get less than 10 per cent of this and steal 8 per cent. The rest of the money will go to foreigners in their banks outside Zambia. Just today, these PF visionless idiots borrowed US$50 million from the African Development Bank (AfDB) through the Development Bank of Zambia (DBZ) for onward lending to the various sectors of the economy. Gemfields said production of emeralds and beryl at the Kagem mine in the African nation slumped 28 percent to 7.1 million carats in the first quarter that ended March 31. Output of ruby and corundum from Montepuez surged 43 percent to 2 million carats.